In mid-2011, I moved to Virginia. I found a church but it was larger than the video and website lead on. I went week after week and met no one. One day, I went to a church connecting event and sat across the table from this couple. “Hi, my names is Elaina. This is my husband Asquith or A.Q.” Once we started learning about each other, we became fast friends. There was also another couple in our church. We became a close group of 5. Standing outside of church well after service dismissed talking about theology, or life. Sitting at the coffee bar hashing out ideas. It was a highlight in my life for sure. Life slowly changes for all of us. Elaina and AQ were called to another church. Then, I moved, then the other couple moved. However, Elaina will always be the type of friend anyone would wish for. She is fiercely loyal, straight to the point and eager to seek God’s will in any matter. It is truly an honor not only to have her as a friend but to be able to have you hear from her! Without any further ado, here’s Elaina’s story. My husband and I met in Miami while working for a community development ministry. After a year of friendship, we choose to commit our lives together before God and our families. Now if you knew me, you’d know I wasn’t the type of girl who longed for marriage or children. I never saw a healthy marriage and used my parents’ divorce as the picture of what the Lord called it to be. I was also told it would be extremely hard for me to get pregnant. I believed what the doctors said over what the Lord could do in my life. And because of all this, I made it very clear to my husband that children were not going to be in our future. I’m sure God laughed at me because He had some very different plans for us. In November 2011, only 1.5 years after we’d been married, I found out I was expecting. I couldn’t believe it! Even with the fear and ‘what ifs’, I could feel the Lord working on my heart, filling me with a desire for children. I was reminded of something a dear friend said to me. She heard from one of our professors at Moody that, “Children are the best form of discipleship.” Those words rung in my head until I finally realized I was both happy and humbled that my God saw it fit to make me a mother. I wish I could say the story ends here with a happily ever after, but it doesn’t. The day before Thanksgiving I felt some deep pain in my stomach, and my husband rushed me to the ER. After some testing and being able to hear the baby’s heartbeat, the doctors were convinced that I was ok and sent me home. I went home relieved and thanking God. The doctors weren’t right. The next morning, I woke up to find blood on the bed. Once again, we rushed to the ER. I remember the hours spent waiting were torture. I prayed and cried out to God in agony, begging Him to save both of our lives. The only option to stop the internal bleeding was to complete a D&C. I had lost my baby, and everything was a blur after that. People kept telling us you’ll get pregnant again. Another person asked me what sin I was in (*that was cruel*). A brother at the time encouraged my husband and I to get away, so we went to D.C. and stayed with a friend. It was a refreshing time for me and my husband to reconnect, for us to cry out to God. The thought of children was pushed to the back of my mind, AGAIN. But God had other plans. Our miscarriage made me numb towards children. My heart was cold towards God, other women who were pregnant or any person that mentioned they wanted children. Meanwhile, my insides were screaming with pain and guilt. Pain from losing my daughter and guilt for feeling angry towards a loving God. I buried my feelings deep down and never talked to anyone about it. We were serving in a church at the time that did not welcome showing any form of weakness. They thought Christians should bring it to God, leave it alone and NEVER speak of it again. Nobody asked me about the miscarriage, and I never brought it up. Fast forward three years, and I found myself pregnant again. This time I was so careful. We didn’t tell anyone until I was about 20 weeks. It was an easy pregnancy considering I was a high risk due to my age (38), but when it came time for me to deliver, there were a few complications. Again, I found myself crying out to God to save this life He gave me. After 32 hours of labor, 3 epidurals that didn’t work, 2 rounds of Pitocin, my blood pressure continued to be too high. I was on the verge of having a stroke, and my son’s heartbeat was dangerously low. They rushed me back for an emergency cesarean. Within thirty minutes I was able to see my son and hear his first cry. I don’t know who cried more… me or him! I kept thanking God for this healthy baby boy, Asquith Malachi Thompson. In the hospital I felt good. There were nurses and doctors everywhere to help, and I had a room filled with family and friends. But things changed when I went home. For the first two weeks I couldn’t walk because my legs were extremely swollen due to medication and the fluid I retained. I was unable to hold Malachi without my husband handing him to me. Nursing him was a struggle. Sleep was a struggle. I was tired all the time, and my son had his nights and days confused. It was overwhelming, as I battled with my own healing and taking care of my son. I knew a week into being home something was wrong with me. When I looked at my son while breastfeeding, I felt nothing. No goo-goo ga-ga. No joy. Nothing. All I felt was sadness… all the time. And I couldn’t focus on anything. I went weeks and months feeling like I didn’t deserve to be where I was. I felt like a bad mother. I felt like I couldn’t care for him the way someone else could, and I couldn’t be a wife the way my husband needed. I feared if I shared my feelings with anyone, social services would take my son away, and my husband would leave me because he would think I was an awful mom. On top of everything, my grandmother was going through cancer, and I couldn’t be there to support her. I felt useless, fearful, anxious and panicky all the time. I questioned God for every emotion or lack thereof, and then felt shame for questioning Him. The cycle was endless, and it was exhausting. I remember several times sitting in the car, with my son in the backseat, thinking he’ll be ok with someone else. I’ll just drop him off with a friend and go end this pain. But the wrestle was always, “I’m a Christian. I’m in church leadership.” And even though we had changed churches and the leadership was very different, I kept telling myself I still shouldn’t be feeling this way. One day I was headed to Malachi’s appointment and decided this was going to be the day. After the appointment I was going to drop my son off with a friend and end it all. I was going to walk away from my life because I was sure everyone would be better off without me. But my good God had other plans. As I was driving to my friend’s house after the appointment, for some reason He reminded me of a task my Pastor asked me to do. I turned around and headed back home. I’d do this final task and then go finish my plan. While I was completing my task, my husband called to check up on me. Before he hung up he said, “Babes, I love you…very much.” After we hung up I wept so hard. Face down on the floor. “Why God? Why have you given me so much pain? Why is this happening to me?” I cried myself to sleep on the floor, with my son in his swing. I woke up to my son crying, and as I breastfed him, I looked down at his face and cried some more. All I wanted to do was cry the pain away. When my husband got home from work that day, I said nothing to him. I couldn’t bare the shame of telling my husband I was set to walk away from everything and end my life. A few weeks went by and my pastor called to see if I had sent an email to a couple at church. I told him yes, and he asked me to forward it to him. When I went to forward the email, I saw it sitting in my inbox… it had never been sent! I broke down sobbing. I couldn’t understand what was wrong with me! I was constantly forgetting things, unable to finish tasks on time. Afterwards, I called my pastor and told him what happened. He asked to meet with me that day, and as he came to my house, he gently asked, “Is everything ok with you?” I broke down and confessed I was struggling with postpartum depression (PPD), and I needed help. At first, as the words came out of my mouth I felt like I was being a false Christian. Was I betraying God? My family? My friends? Was everything I knew to be true about God a lie? How could I even feel this way? No good Christian should feel “this way.” Christ had done so much for me… My head was a fog of lies that I had believed for almost an entire year. As my pastor listened, he suggested I step down from my role at church and focus on getting healthy again. I was open to ALL help, whether it be medical or spiritual. I met with a biblical counselor, and she told me to try the counseling for three months and if at any time I wasn’t getting better to go see my doctor for medical help as well. She also connected me with another lady who was going through PPD. Together we started reading a book called Depression: Looking up from Stubborn Darkness by Ed Welch. That book gave me categories for my depression. It gave me hope when my life seemed so dark and lost. Counseling, my local church, a community of patient sisters and, most of all, the Word of God helped me face many struggles and lies. God used a misplaced email to help bring my depression into the light. And I was brave enough to cry out for help. The grace of God kept me alive, and the grace of God keeps me fighting for my life every day. For me bravery is confessing… Confessing shame, guilt and my hearts darkest fears. Most of all, as I acknowledge my need for my Savior, my courage grows. I still struggle with my depression, but I have been shown healthy ways to live with it. It is a temporary form of suffering I endure on earth that daily draws me nearer to Jesus. Each day I have to speak Gospel truths to myself. When I start believing lies and I begin feeling my depression, I have to reach out to others. I am grateful for our church and the security I feel within. We have a saying we live by, and it can be found here: Gospel, Safety & Time. Throughout it all, depression has brought me into a deeper faith and trust in my Heavenly Father. And I wouldn’t have had it any other way. Elaina has been blessed with a wonderful, patient, loving, humble husband; Asquith (AQ) Thompson and a very vibrant, intelligent and energetic son Malachi. They are truly the best gifts her Heavenly Father has seen fit to give her. She received her Masters of Urban Ministry from Moody Theological Seminary in Chicago in 2008 and soon after moved to Florida to serve as a Community Development Missionary in Miami, where she met her husband while serving together. Their family now lives in Newport News, VA, where she is currently studying for the Association of Certified Biblical Counselors Certification. She also serves as the deacon of hospitality at Hampton Roads Fellowship. Asquith & Elaina desire to grow in the knowledge of the Gospel, church planting and the importance of the local church. They hope to plant a church in 2021 in Barbados. To connect more with Elaina contact her through Facebook @facebook.com/elainav. “Good luck, and be careful.” Their commanding officer said as they headed out on their mission. They went in thinking they’d be on their way in 30 minutes. Little did they know it would be one of the most grueling 15-hour-fight many of them had ever seen. They essentially had stirred up a hornets’ nest. Many of their fellow men would be coming home in body bags. After so many lost life you’d think the outcome was a success. However, Nothing changed that day. Yet, so many men walked away changed, forever. I watched Black Hawk Down partly because I just finished a book by Dr. Nik Ripken called The Insanity of God. Nik was an aid worker in Somalia before (and after) the UN sent troops in. It was hard to watch, but It got me thinking. The spiritual life is a battle. We are in a war that has already been won, but we still have to do our part. We are soldiers in the midst of a very dark world. We receive fire from a very real enemy. 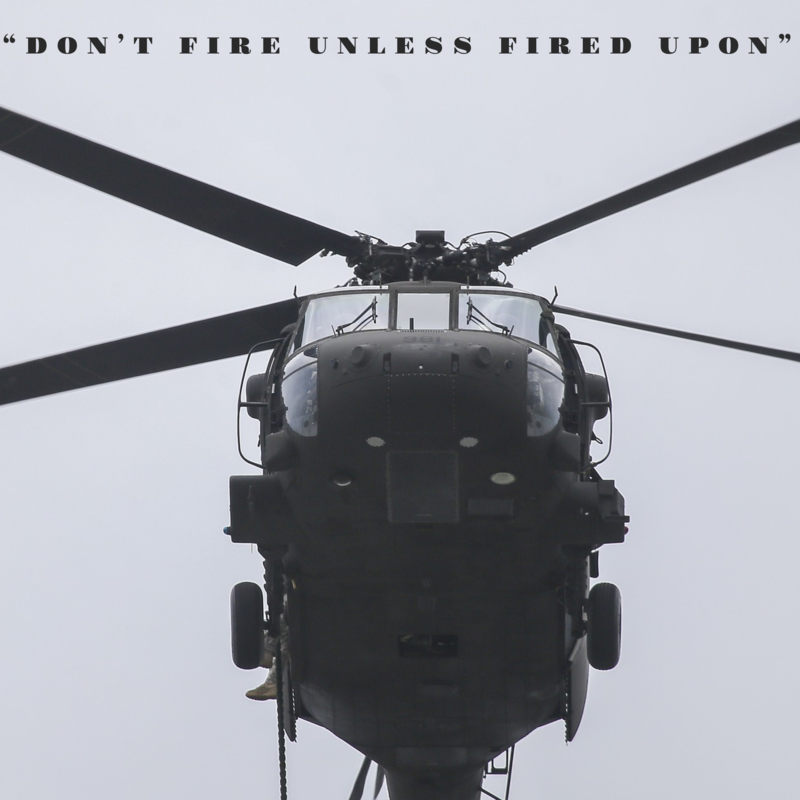 In Black Hawk Down Major General William F. Garrison commanded that no one was to fire unless fired upon. How many times in life have you been doing life and suddenly you realize you’re being fired upon? Your kid gets bullied, your spouse leaves, your health plummets, you’re falsely accused, you or your family are victimized, a natural disaster hits, you or your loved one get caught in a “random act of violence”, your house floods, your car gets totaled, you get fired. All of a sudden, nothing matters anymore. You are in shock, watching and hearing bullets whiz by your head. You knew this could happen, but maybe you thought It wouldn’t really be like this. You knew there “would be trouble” but this is not the trouble you foresaw. You’re scared. You hate it. 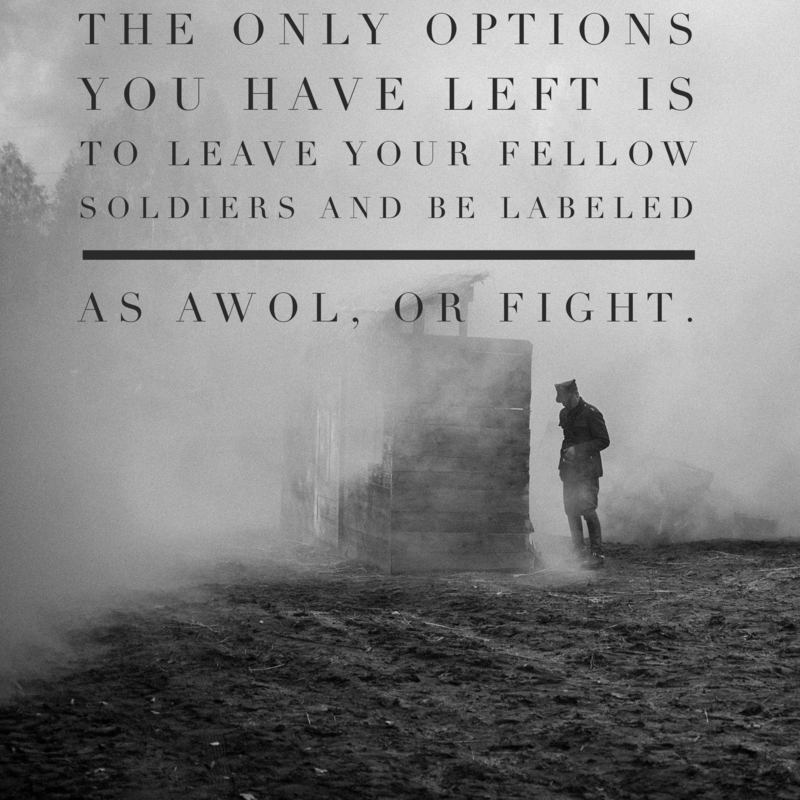 You want to get out, but you’re in the thick of it, and the only options you have left is to leave your fellow soldiers and be labeled AWOL or fight. We may not be facing literal bullets, but we are in a battle. There’s no denying it. After experience a very hard “battle” I had someone say to me, “Christi, what you experience was friendly-fire. Instead of helping you, they left you to bleed out” Have you ever felt as though you’re bleeding out? You feel like your life is draining out of you? In battle, we need our fellow comrades. We need them to cover us to get to shelter. And we need to cover them so they can get to shelter. As we are being fired on from multiple directions, we need someone at our back. If we are hit we need someone to drag us to a safer place. After being hit, sometimes you have to keep going. And other times, you need a medevac to get you out to recoup. Each battle you and I face is different. Because there is another training God wants to teach us. During the battle for Mogadishu, the US soldiers hid out in buildings trying to hold their position. As I was watching this movie I thought of how sometimes, even if it’s just for a little while, God is that shelter for us. If we go in deep enough we can catch a short break and recoup a little bit. Sometimes, in the middle of a life battle, we come across a song or a passage of scripture and holding on to that gives us the courage to press on. So whatever your battle may be, make sure you’re not fighting It alone. You and I desperately need each other and we desperately need God’s strength and the Holy Spirit to guide us. Stand your ground. Guard your fellow soldiers back. Be strong and courageous. NOTE: For those of you who are in the military and have served, I want to say that I am deeply grateful for your service. I also cannot fathom all that you have endured and I do not want to make light of the war zone and how horrific things are on the front lines. Watching this movie helped me keep in perspective that we are in a spiritual battle. I hope that what I wrote was not disrespectful in any way. And once again, thank you for your service! I suited up as I do semi-frequently on Tuesday nights. I put on my chest guard, boots, gloves, mouth piece and helmet. I got out on the the floor and warmed up with one of the 2nd degree black belts. It was sparring night. But this night left me with a picture that I can’t seem to get out of my head. After warming up with this particular black belt, I started sparring with her. I kept getting nailed in the head. I would try to block the hits, but after the first punches, I’d find myself a little discombobulated. I was having a hard time adjusting myself to get on top. After this fight, my instructor said I should spar another 2nd degree black belt. I really didn’t want to because I find him intimidating. It’s against natural instincts to lean into someone whose throwing punches. Our first reaction is to turn or to run away. However, since my instruction is a 5th degree black belt, I did what he said. The sparring resumed and the punches started coming. Before I got discombobulated, I leaned in, rested my head on my opponents shoulder and held on. By doing that, I could no longer get hit. The punches seized. But it was as though we were wrestling. This 2nd degree black belt didn’t want to be held down and I didn’t want anymore shots to the head. We were fighting for our own wills. I felt like that has been a picture of the past few years. It has felt like one punch after the next. I want to flee , but I know I can’t, and yet, I don’t know how to respond. If I’m being honest, my first reaction, to the loss of my Dad, wasn’t to lean into the punches. I believe everything that happens in life goes through the hands of a sovereign God. So the punches that have taken place went through His hands before they hit me. I need to lean in. I’ve needed to wrestle with questions. Why? What’s the purpose for all this pain? Why so much heartache? Why so many closed doors? Why the standstill? Whose benefiting from all this grief? I feel as though I’ve been holding on trying to shake God for some kind of sense for the loss of my Dad. I haven’t been able to say much, and when you’re grabbing your opponent, you don’t speak. You’re just trying to regain your composure from the blows you’ve taken. You’re trying to survive. It’s your strength against your opponents. This past week I also remembered the fight doesn’t end by hanging on. You cannot win a fight by clinging on to your opponent. You’ll get called out. You have to let go and get back into the fight. 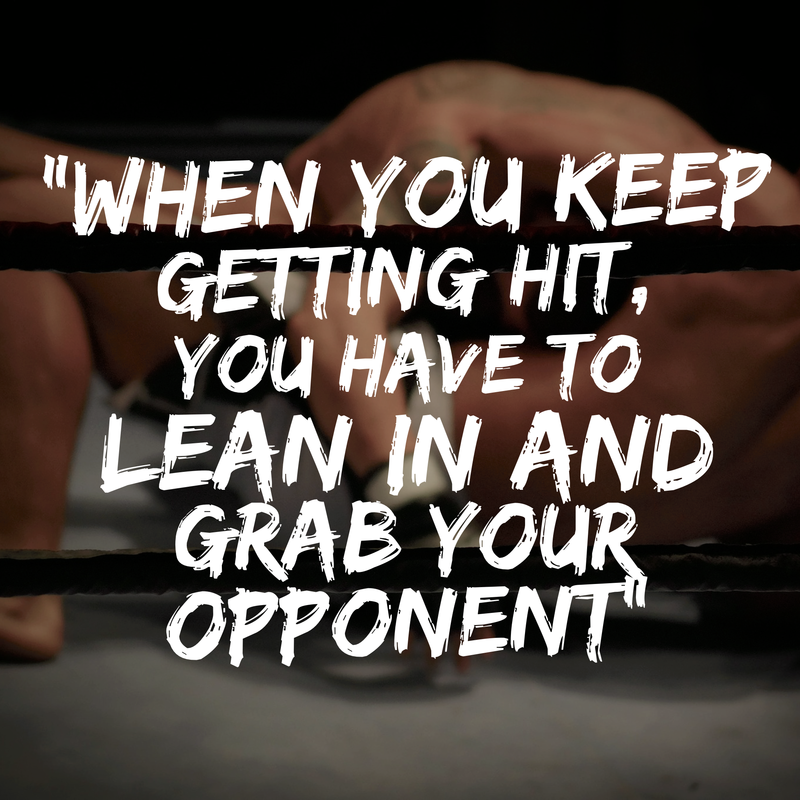 But, hanging on and leaning in is still apart of the fight. Every relationship will go through ups and downs. The same is true for our relationship with God. 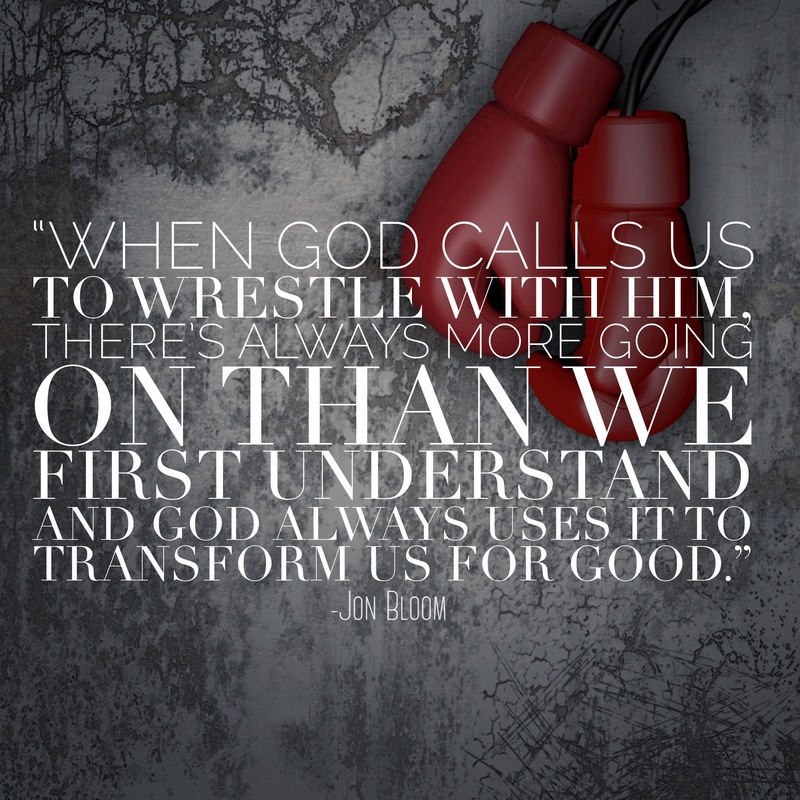 Tough things happen and we need to wrestle through them. I would be lying if I said, I haven’t been struggling. I’d be lying if I told you I haven’t doubted that any good would come from this. I would be lying if I told you I haven’t felt like giving up. I would be lying if I told you I haven’t had some days when I don’t want to get out of bed. As I write this I’m reminded of Peter in Matthew 26:35. “But Peter declared, ‘Even if I have to die with you, I will never disown you.’ And all the other disciples said the same.” The next day, Peter denied Jesus. Death and suffering changes people. Peter thought he could be a disciple of Jesus on his own. I think, subconsciously or even consciously, I did too. Things started changing in my heart about a week ago when I realized I didn’t have enough to get me through. I was keeping God at a distance. Attempting to hold Him like I had in sparring. I don’t want anymore hits. I can’t take another blow. I was falling into a deeper and darker hole. Until the thought popped into my head, “You don’t have enough faith”. I can do nothing on my own, I cannot handle this loss alone. I cannot handle closed doors alone, but God never asked me to. He said to come to Him. Lay it down. Cry it out and walk with Him. So, I started waking up and asking for help. After that, I read one verse. My mind can’t process a whole chapter at the moment, bug I can hold on to a verse. At the end of the day, I am human. I’ve struggled with being on this road that God has allowed me to be on. But struggling and giving up are two different things. Because God has not given up on me and gives me everything I need when I ask, I can keep putting one foot in front of the other. The truth of the matter is, I am in a battle and it’s not against God. Yet, sometimes I wrestle with God’s will because, if I’m being honest, right now, I don’t really like it. But the more I try and fight for my will the more miserable I become. As hard as it has been I do pray that just like in Jacob’s case, God prevails in my life. He knows what He’s doing and knows the plans and I do not. For now, I will keep waking up and asking for help because I cannot do it on my own. When I started writing on Fighting Fear , one of the first people I asked is my friend, Kristi. I have only known Kristi for a year and a half, but I cannot imagine life without her. She has become one of my dearest friends. The one thing I love about Kristi is how quick she is to listen, and to speak truth. Not only do we share the same name, but we both are Pastor’s kids. We both have been Personal Assistants, and share similar ups and downs. It is honestly a joy to have a friend like Kristi. It was during one my hardest seasons that God allowed Kristi and I to meet. If every dark season brought a friend like Kristi, I have little to complain about. Thank you, Kristi, for sharing your heart with us today! Depression is like a cancer to your soul, one that comes like a thief in the night. It steals all joy and light in its path, leaving behind a complete and utter darkness that embodies your very being. In my very dark and lonely season, I was experiencing a world of confusion. On the outside, my life was full, filled with beauty, and people who loved me. On the inside it was like my soul was raging war against my mind, breading lies into the deepest part of my soul. “You’re worthless ” it spoke. “No one sees you” it whispered. The voices without became drowned by the voices within. I could no longer hear the messages that spoke life into my soul, I could only feel a voice within, beckoning me to believe that my life was worthless and void of purpose. I didn’t choose depression. I never thought a woman who loved God with all of her heart could struggle with such a dark and deep “thing”. I didn’t even know what to name it at the time. I struggled to believe I was facing depression until I went to my doctor and licensed therapist. I was diagnosed with major Depressive Disorder. I took the diagnosis as it was my new identity and wore it like a jacket. Each feeling I felt in the carousel of negativity, circling around me, I began to wear it like an article of clothing. It felt heavy. Every day I woke up, I chose to put on those same articles of clothing, until one day I realize how much weight I was carrying. I allowed myself to sit in a state of depression for so long that I eventually believed that’s how I would always be. Medicine scared me, the therapists made me face my worst fears head on and the people around me didn’t understand. I felt trapped… totally and completely alone. The worst part about it all was that no matter where I went, it was there too. I was stuck with this deep voice that rang loud in my spirit of worthlessness. My pillow became my daily resting place to cry and moan, yell and groan. I needed help, I longed to be saved, and I only had one place to go… my room. One early morning while the sun was still coming up and the light streamed through the curtains in the window, seeming to dance on the walls in my room. The light was radiant, bright and almost appeared to be glowing. For the months leading up to this morning I had hibernated in the darkness of my room after work and classes. I found safety in what seemed like shadows and dim lit places. I hadn’t yet realized that I was entertaining the light dancing across the walls because it seemed so majestic and brilliant. The more I sat there watching the light, the more I became intrigued at how it moved across my room. I felt a breeze move through my room suddenly. I quickly glanced over to the window to see if I had left it open. To my surprise, it was closed. I felt it again. I turned to the other side as if I had felt it brush against my back. Again, there was nothing. Then, there in that moment, I heard him speak. “Out of the ashes and the dust you will rise, my daughter”. It was as clear as day, the voice of God rang out in my room and I audibly heard Him speak into my very soul. I fell to the floor and cried out to the Lord, who I thought had long forgotten me. He spoke again. “Awake, oh soul. I AM your victory. I AM yours and you are mine”. It was there that God spoke life into my being. It was as though He was speaking life into my depression. I felt the weight and burden and voices lift off me, and at the very same moment felt a surge of joy and peace, and renewal enter my body. Christ had redeemed me once again. He stepped in rescuing me out of the mud and the mire, and releasing me from the snare that so closely entangled my very existence. Freedom rang loud in my soul that day. The enemy is cruel isn’t he? He thinks of himself as powerful and crafty and has a soul purpose of devouring any lovely, joyful, happy Christian. I mean, how dare he mess with me for two years! Fighting depression is a lot like fighting a shark when fishing. When at first the shark bites the bait on the end of your line, it runs, and I mean hard. If you’re not in good shape or workout you can forget it and call it a day! He will give you a serious run for your money, and you won’t get it back. You’ll likely get dragged into the ocean and eaten alive. Okay that’s a bit dramatic, but go with me here for just a minute. It’s not a matter of if, but when the enemy will show up. If you’re not ready, conditioned and alert, you too will be dragged out and enticed (not literally eaten, don’t worry). When shark fishing, you can almost guarantee that every shark has about 4 to 5 minute run in them until they finally tire out. Let me break this down for you even more. The enemy is so devious. He will come at you every which way and doesn’t tire easily, so you have to be prepared to fight through at least a few runs before you can be sure he is long tired out and has decided not to mess with you anymore. Do you think if you had to reel in a 6-foot Black Tip shark today that your body is well conditioned to handle it? Well, you don’t have to worry right now if you haven’t made it to the gym in the last couple of months. The type of conditioning I’m talking about right now is spiritual. It’s often the battle over your mind that the enemy will target first. Once he has you where he wants you, he will then target your inner core by trying to get you to believe the lies are rooted deep in who YOU are as a person. It’s all rubbish! The enemy can’t win! God is more victorious and will deliver me! These are things I hoped to believe after I was redeemed out of the pit of darkness and depression. I quickly learned that I couldn’t just stop there. This wasn’t a one shark kind of fight. I soon realized that if I was going to do this Christian life well, that I needed to be better spiritually conditioned and on guard for the next time. For months after I feared I wouldn’t be ready or even strong enough to combat the enemy once again. I was tempted to run and hide all over again and thought maybe the shadow thing would be better. It would maybe be easier to just hide! I was so totally and completely wrong. 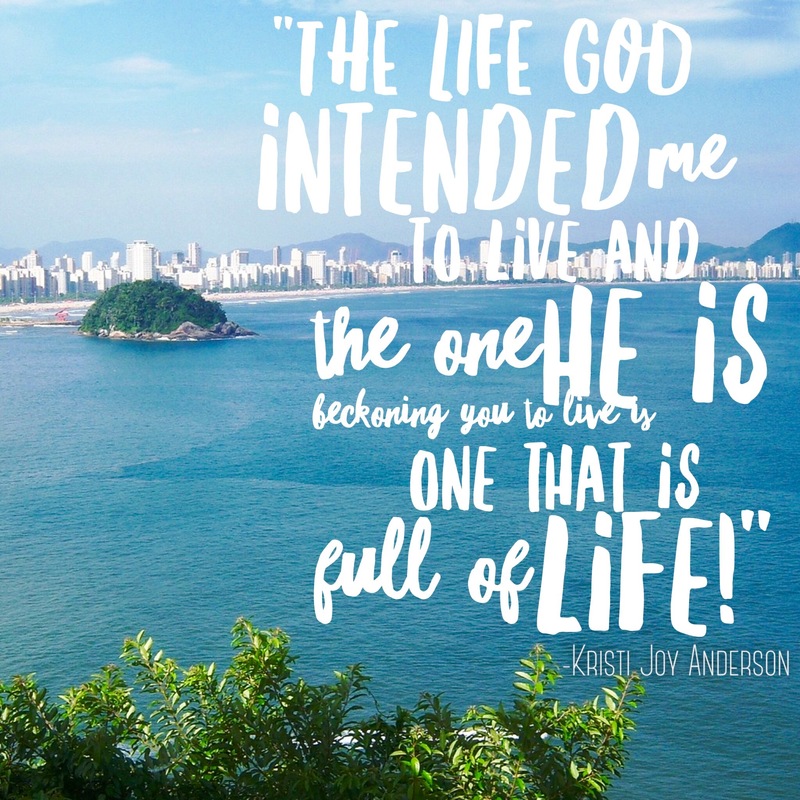 The life God intended me to live and the one He is beckoning you to live is one that is FULL of life! I decided that no matter how many runs the enemy would try to make in my life that I wanted to be ready and totally capable to ward off his crazy nonsense. I wanted to be fully armed for the next time he would make his attack on my life. So, I did what I knew God was asking me to do. I got serious about knowing and speaking out God’s truths. I mean, I would daily walk around speaking out scripture. Sometimes I looked like I was talking to myself and I’m sure some people thought I was crazy. 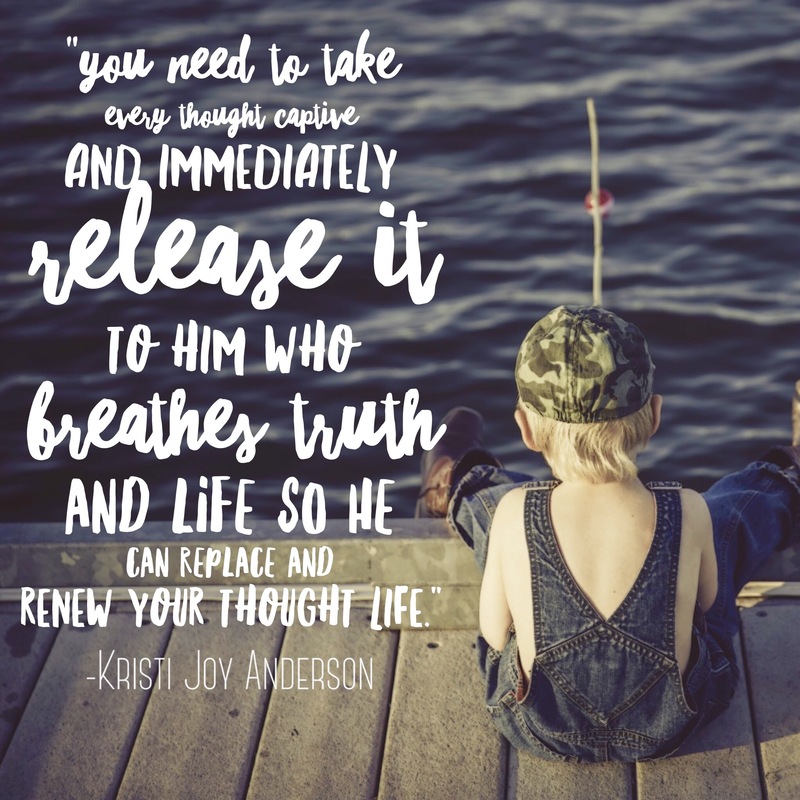 You need to take every thought captive and immediately release it to Him who breathes truth and life so He can replace and renew your thought life. Lastly, just like when shark fishing how you need at least a partner or three to help you reel in the wild beast of an animal and bring it on shore, you’ll be needing the same in this game. It’s time we come together and join forces. We are only so powerful and effective alone, so we need to round up some of our most trusted, loyal, and truth-speaking friends. Invite them on the journey with you. Doing life together will be one of them most powerful and life giving decisions you can ever make! I choose three girlfriends who I knew could battle the storms with me and who I could equally influence as well. Together we decided it was time to take a stand and live the life that God called us to, living like the fearfully and wonderfully made prized daughter of the one true King! Watch: Kristi literally catches a shark! Heidi and I became friends while I was at Bible College. She was my mentor during the school year and was my head counselor during summer camps. We had our ups and downs during that year, but the friendship we share is one I cherish deeply. Heidi is someone who is always seeking to be more like Christ in whatever situation she finds herself in. She and I have shared a great many laughs together and it is a privilege to have her story here today! Fear– it’s a word we often say, hear or even feel. I experienced fear in a way I never had before when my newborn baby boy was diagnosed with a heart defect. At the time of birth, seemed healthy and we were ready to start out a journey as a family of 4! But, our healthy baby Aiden soon took a turn for the worse. At first, the doctors had no idea what was wrong. Fear, yeah, I’d say I was fearful. The thoughts of losing my baby filled my mind as they did tests, put him on oxygen and looked at my husband and I and said, we have to transfer your baby to another hospital; because we don’t know what’s wrong with him. Watching my baby hooked up to oxygen because he couldn’t keep his O2 levels up, IV’s and cords everywhere. I would say that fear overcame me. Driving from one hospital to the next praying that God would give the doctors wisdom and that God would save my baby. It was God’s strength and grace that got us through the next week of crazy life. Within a half-an-hour of being at a new hospital our son was diagnosed with Critical Pulmonary Valve Stenosis. At 2 days old our baby went into the OR to have his first heart surgery. The surgery lasted 4 hours. That 4 hours seemed like forever. Fear was quickly overcome with peace during the surgery. We had to cling to the truth of who God was. We had people all over the world praying for us and lifting up Aiden and the doctors to the ultimate Physician. The cardiologist thought the surgery was successful- we just had to wait for our baby to gain strength and be able to keep his oxygen levels up. From birth to discharge we were in the hospital for a week. Every time our cardiologists came in to see us, and talk to us about our precious Aiden- he said he had never dealt with parents who were so calm and had such a peace about them. I can sit here now and tell you- that is the power of the Holy Spirit working inside of us. Inside I was falling apart- this is not what I had expected or what I would want for my baby. But God had bigger plans for me personally, for my baby and for our family. God showed Himself to us in huge ways during this journey. During the dark hard moments, I had people speaking truth into my life. We need to do life together, and we need to surround ourselves with people who have the same core values and belief in God that we have. We don’t know when trials are going to come. We don’t know when the journey is going to seem dark, but it’s in those moments we need others to hold us up and push us through. We were missionaries in Africa prior to us having Aiden- and if I had given birth to Aiden in Africa, Aiden would not be alive. God brought that to mind to me A LOT while we were in the hospital. God orchestrated us as a family to move to a different area and for my husband to find a different job. At the moment of transition, we weren’t sure what was going on or why God was moving us on, but hindsight it was for Aiden. God brought us to an area that has one of the top pediatric cardiology hospitals in the US. God has big plans for this sweet baby boy of mine, and it all started before Aiden was even born. How cool, that the God of the universe cares about every single detail of our lives. Big or small, He always shows up! There are 2 passages of scripture that continued to run through my mind during this season of life. Psalm 139:13-18 which talks about how God knit us together in our mother’s womb, and He knew our unformed bodies, and our days are numbered before Him. God knew every detail about Aiden’s heart and body before he was even born. God was not caught by surprise! The other passage was Isaiah 41:10 Fear not, for I am with you; be not dismayed, for I am your God; I will strengthen you, I will help you, I will uphold you with my righteous right hand. Our journey is not over with Aiden’s heart. We have follow-up appointments every 2 months and he just had another heart surgery in March, which was unsuccessful. We are now in the waiting game to see if we will try another cardiac catheterization, or if he will need open heart surgery. They were hopeful he would only need one surgery, and now we are gearing up for his 3rd. Sure, it’s discouraging, and can be overwhelming. But through all of this God has given me so much grace to face each twist and turn that this story has unfolded. The strength that helps me and my husband be strong is only from Christ. 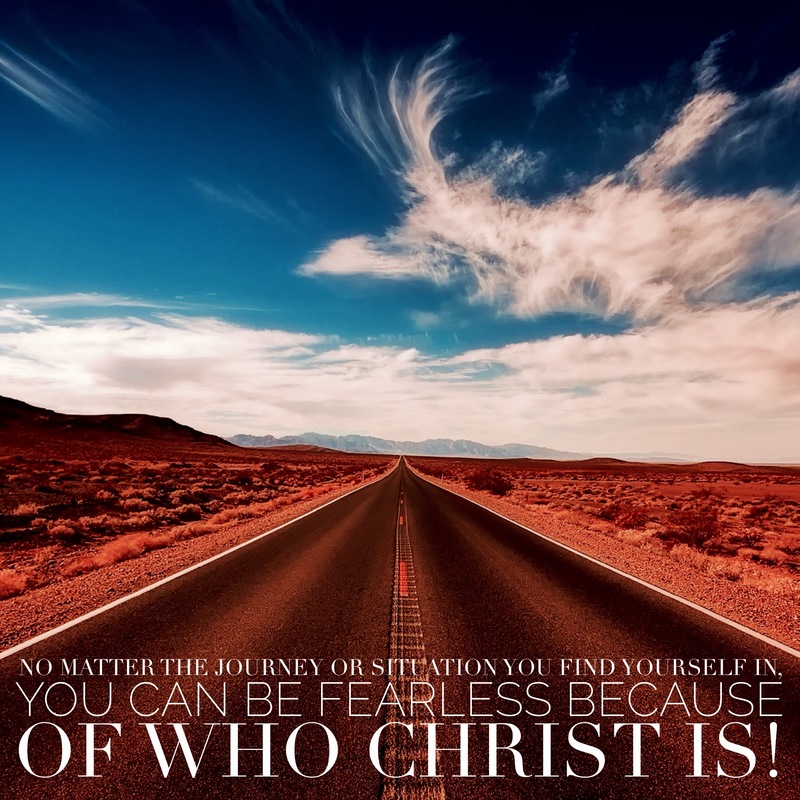 No matter the journey or situation you find yourself in, you can be fearless because of who Christ is. Deuteronomy 31:16 “Be strong and courageous, do not be afraid or tremble at them, for the LORD your God is the one who goes with you. He will not fail you or forsake you.” As you let the truth of that verse sink in, you’ll realize there is nothing we cannot face because God goes with us. 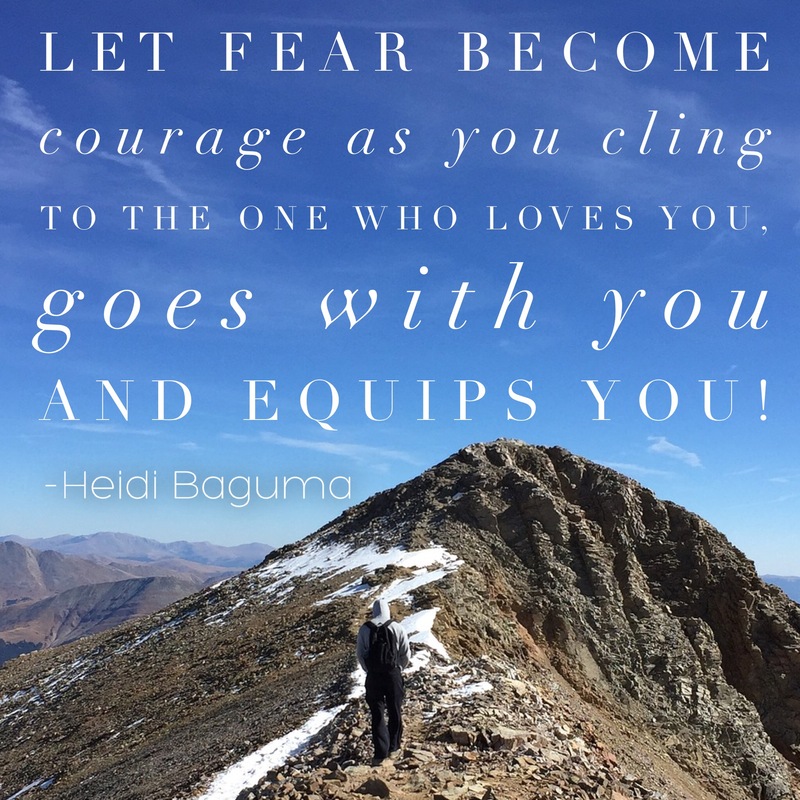 Let fear become courage as you cling to the One who loves you, goes with you and equips you. Fear: A distressing emotion aroused by impending danger, evil, pain, etc., whether the threat is real or imagined; the feeling or condition of being afraid. Fear can drive us to do all kinds of things: spend money we don’t have, isolate ourselves, and even stop living a full life. But, what if we chose to live fearless? How much greater would the impact be? What would our lives look like? This month I decided to ask some of my dearest friends and family to write a blog on the topic of fear, and how they’ve overcome it. Fear comes in many different sizes, situations, and circumstances. In a day with suicide bombing, “random acts of violence”, shootings, nuclear threats, terrorism on the rise, and diseases with “unknown” causes and “unknown” treatments, it is natural to be fearful. As believers, we are not GIVEN the Spirit of fear. Fear causes us to retreat, hide out, and stay quiet. Again, we are human. But through Christ, and Christ alone, we can press past our fear. We can overcome. Incredible power and strength come when we share our story. Because of Christ, we can brag in our weakness, shortcomings, humanity because it is Christ in us, the HOPE of glory! He is our only hope. It’s about His strength in our weakness that allows us to be overcomers and fight past our fears. This is NOT about pulling ourselves up by the bootstraps and being fearless in our own strength! We don’t have it in us, we are fragile, timid and quite incapable. In the Bible, God refers to us as sheep more than 200 times. Why? We are fearful, stubborn beings that need A LOT of help. Psalm 23:2 says, “He makes me lie down in green pastures, he leads me beside quiet waters” I once heard someone say, it was quiet waters because the noise of a stony brook would have scared the sheep! Fear is something we are born with; but, it is not from God. It is a part of this sin-cursed world we live in. But, we can overcome dear friends! Sometimes, sharing our story is a very real fear that we have to overcome. But, when we share our stories we experience a strength we may never have known was there. I like to think of a soldier on the front lines. When he shares his story, I picture him reaching down and linking arms with another soldier. We are a stronger force against the enemy when we link up. We need each other in this fight. We are not made to do this alone, we cannot do this alone without paying a higher price than we can afford. When you get knocked down, you need someone to pick you up. When I get knocked down, I need someone to pick me up. Maybe through some of these stories, you will be lifted back up. That is my prayer at least. I hope these testimonies will bring courage to your hearts and minds! GREATER is He who is in us than he who is in the world. God is for us. He is with us. He is our strength. He is our fearless commander and we can trust Him to lead us in this battle called life.